Grapefruit is highly nutritious member of the citrus family and known for its slightly bitter and sour taste. This Fruit has a slightly thick and tough skin than that of oranges and inside, the flesh is segmented like oranges. The fruit is very juicy and acidic varying in colors ranging from white, pink and red. Like all other citrus fruits, grapefruit is loaded with significant amount of vitamin C and plays an important role to boost your immunity. In addition to being rich in Vitamin C, it contains moderate levels of Vitamin B complex such as Folate (folic acid ), riboflavin, pyridoxine and thiamine. It also contains the fiber pectin, and the pink and red hues contain the beneficial antioxidant lycopene. Antioxidants present in grapefruit helps to reduce cholesterol level in a person. Doctors always recommend dietary changes for people who want to reduce cholesterol. It is advisable to include grapefruit in your diet if you suffer from cholesterol problems. It is particularly helpful for those people who abstain from taking medication. Eating grapefruits can decrease cholesterol level up to 15 %and can decrease triglyceride levels up to 17%. Grapefruit also boosts heart health and reduces heart disease. A glass full of freshly squeezed grapefruit juice in the morning is a great remedy to control constipation. The juice stimulates the colon and other parts of the body relating to the digestive system. This is due to the stimulating effect of fiber on the secretion and stimulation of gastric juices that ease the constriction of the digestive tract and induce a bowel movement.The insoluble fiber pectin acts as a bulk laxative and not only prevents constipation but protects the colon from toxic and cancer causing chemicals. Grapefruit is full of flavonoids which help the body fight infections and keeps the body free from carcinogens that can cause cancer. Grapefruit contains high level of pectin which acts as a bulk laxative and helps to protect the colon mucous membrane by decreasing exposure to toxic substance in the colon. In colon cancer it encourages the suicide (apoptosis) of cancer cells and the production of healthy cells. Drinking 1 glass of grapefruit juice daily helps to prevent colon cancer. It not only kills the cancer cells but also promotes the production of healthy colon cells. In colon cancer it encourages the suicide (apoptosis) of cancer cells and the production of healthy cells. Grapefruit juice reduces risk of calcium oxalate stones developing in the kidneys. It increases the pH of the urine and increases the excretion of citric acid. Grapefruit contains a compound called d-limonene that prevents the formation of and dissolves renal stones. One study from the British Journal of Nutrition found that women drinking a half a liter to a liter of grapefruit juice every day lowered the pH levels of their urine, thereby decreasing the risk of developing kidney stones. However, if you are already being treated for kidney problems, grapefruit juice may hinder the effectiveness of any medications you may be taking. The pulp of grapefruits contains glucarates, a type of phytochemical that has been shown effective against breast cancer.In another study, the bioflavonoids found in grapefruit were discovered to even halt cancer cells from spreading in breast cancer patients by ridding the body of excess estrogen. High contents of Vitamin C in grapefruit prevents oxidation of cholesterol thereby preventing its deposition as plaque in the arteries where this plaque can lead to narrowing and blockage and cause heart attack and stroke. It therefore improves cardiovascular health. A simple glass of grapefruit juice, if drunk before going to bed, can promote healthy sleep and alleviate the irritating symptoms and repercussions of insomnia. This is due to the presence of tryptophan in grapefruits, the chemical we often associate with becoming sleepy after big meals. The levels of tryptophan in grapefruit juice helps us to sleep peacefully. The flavonoid content in grapefruits help the body to fight off infections and keep the body safe from illness and diseases. Eating a grapefruit every day or drinking grapefruit juice daily provides immunity against infectious diseases. The pulp or the juice of grapefruit helps patients recover quickly from fevers, and it reduces the burning sensation that occurs when the body reaches a high temperature. It is also known as a way to boost the immune system against colds and other common illnesses. Grapefruit juice, when combined with water, can quench thirst very quickly and can keep you hydrated longer. Most of these benefits come from the high content of vitamin-C in grapefruits, which acts as a general immune system defense system and can help the body fight to break fevers. The juice, or the fruit itself, contains valuable and natural ‘quinine’ which is advantageous for the treatment of malaria. Quinine is an alkaloid with a long history of treating malaria, as well as lupus, arthritis, and nocturnal leg cramps. It is not an easy component to find in many foods, so grapefruits are a beneficial and rare example. The quinine can be easily extracted from the fruits by boiling a quarter of grapefruit and straining the pulp. A diabetic can safely eat a grapefruit. In fact, more consumption of this fruit will help reduce the starches and sweets in the system. If you are at risk for diabetes, consume more grapefruit juice to help prevent it. If a patient is diabetic, intake of grapefruit can help them to regulate the flow of sugar in their body, effectively handling the disease. Grapefruits and grape juices are proven to help people lose fat and maintain a healthy weight.Many people use grapefruit in their breakfast to reduce their waistline. 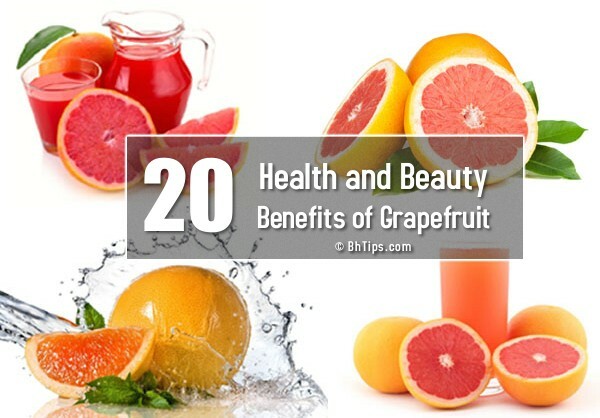 Popular dieticians and nutritionists always recommend including grapefruits in daily diet chart because there is scientific evidence that eating grapefruit on a regular basis helps to lose weight significantly.It is said that smell of the grapefruit reduces the feeling of hunger, which is the reason why people often include grapefruit in their weight loss programs. The high amounts of fiber contained in this fruit can also satisfy hunger and help people avoid the temptation to overeat, since it is a bulky food, and stimulates cholecystokinin to be released, a hormone that regulates digestive juices and acts as a hunger suppressant. Grapefruit juice is also beneficial for people with sore throats and coughs. Drinking freshly-squeezed grapefruit juice helps relieve sore throats and soothes coughs. Grapefruit contains a number of liver detoxifying and cleansing agents, among them are various antioxidants and phyto nutrients called limonoids that help to excrete toxic from the liver by making them more water soluble. Grapefruit also contains naringenin which causes the liver to burn fat rather than store it. Pink and red grapefruits have a good amounts of beta carotene that are necessary to keep the eyes healthy and improve the vision. Just one grapefruit a day is enough to maintain the vision and fight the ravages of eye strain and ageing. The fruit contains good level of Vitamin A and flavonoid antioxidants such as naringenin and naringin and is also a good source of lycopene, beta carotene, xanthin and lutein. These anti-oxidant properties are good for vision. Eating 1-2 grapefruits a day help to reduce gum bleeding. Grapefruits also increase plasma Vitamin C levels and help to manage periodontal(gum) disease. Rich in Vitamins and essential minerals, Grapefruit is highly beneficial both for the mother and fetus. The bioflavonoids and vitamin C help reduce water retention and swelling of the legs during pregnancy. Grapefruit contains folic acid, calcium, vitamin B complex and potassium that are essential for the proper development of the fetus. The high amount of Vitamin A in grapefruit along with other powerful antioxidant combat skin damage caused by oxidative stress. Grapefruit helps maintain adequate moisture levels in the skin, protecting it from dryness and wrinkles. High contents of Vitamin C in grapefruit stimulates the production of skin collagen that brings natural smoothness and elasticity to the skin. The retinol antioxidant gives your skin softness, renews damaged skin, treats skin pigmentation and and give you soft and glowing skin.